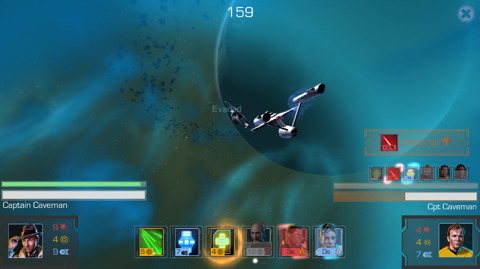 Mobile Game Review - Star Trek Timelines — GamingWithSwag.com - Dads By Day, Gamers By Night. The quality of phones games after Angry Birds showed they could make a ton of money has been skipping up considerably in recent months with more popular licenses jumping into the fray like Fire Emblem, Dynasty Warriors, and Star Trek. I plan to check a few out and provide some thoughts but feel free to tell me which ones are worth the time if you are already addicted to one. I spent some time playing the Timelines game for the past few weeks and I have a few thoughts. A lot of Captain joke names, here I am destroying another "Captain Caveman" I would like to tell you I don't yell "Captain CAVEMAN" everytime. More like every other battle. The premise is that a crisis has damaged the many timelines of the Star Trek universes and the unpredictable Q (he provides voice work) has recruited you to gather a crew spanning all the TV shows and movies (movies featuring TV casts, no Chris Pine era yet) and solve the many problems this has caused. Like many mobile games there are artificial limitations on what you can do which is always possible to overcome with money and this game is harsher than some other games in requiring you to pay money to really explore the game. First, your crew is weak to start and while you can earn crew it is slow going. Then you need items to level up your characters, and getting them all is also slow going. Each character has skills and characteristics based on their representation on the screen which make them more suited to different tasks. So the famed Captain Picard is skilled in Command, Diplomacy, and Science for instance. As he levels up those skills become more powerful and many missions have minimum requirements to enter or to be successful so you hustle to level people up to a range of usefulness. On top of trying to get crew, equip them, and level them up you also hit barriers of how many crew you can possess, how many actions you can take, how often you can battle other players, what ships you have access to (they can also be leveled up), etc. So...many different pressures to get you to shell out money. I will say that the $3.99 monthly deal they offer is cheaper than most games offer and is fairly useful if you were to be wise with the money. You should be able to buy 4 premium or event packs a month with that money which will help you get some sweet crew in a quicker order. "She's a lady all right. And her name is...Enterprise"
Those of you who want to play and not pay money, will likely struggle with the limitations. Like one recent event was made to only allow common characters which seemed like a bone thrown to newer players and the first mission of the first challenge required twice the skill of my strongest character. (See below) Oh, and I paid some money. Yikes, apparently being Chief Medical Officer isn't enough to "scan" someone. Having griped about the Trump-esque pay walls surrounding this game I will say it has a lot going for it. It goes DEEP for fans of the shows featuring obscure characters/items/races to delight you. Remember when Picard went into the Holodeck to play as Private Eye Dixon Hill? I have that character and he is my Captain Icon. Remember when Shooter McGavin from Happy Gilmore was in Star Fleet for an episode? Boom! I got that cat. The game also has great visuals and sound effects for a mobile game. It helps that the theme is iconic, but they got a bunch of audio clips and a few actors provided some dialogue. The game is a little light on skill and mostly rewards people that continue to play or throw money at it, but for fans of the series I think you will be tempted to do one or both. If you are not a fan of Star Trek you should check out the shows, but skip this game until you are fan enough to care about the minutia they slid in for us.